Forums - Chrome shows "iGetterMessagingHost is not installed..."
"iGetterMessagingHost is not installed. Please relaunch iGetter for proper reinstallation." This error may appear if you have iGetter Extension installed in Chrome, but iGetter app is deleted, or moved to other location, or its integration with browsers is turned off. 1. In Chrome > right click in a web page > select "iGetter" contextual menu > "Disable Integration" command. This will disable temporarily iGetter integration until you restart Chrome. Or type "about:extensions" (without quotes) in Chrome's address bar and disable iGetter Extension. 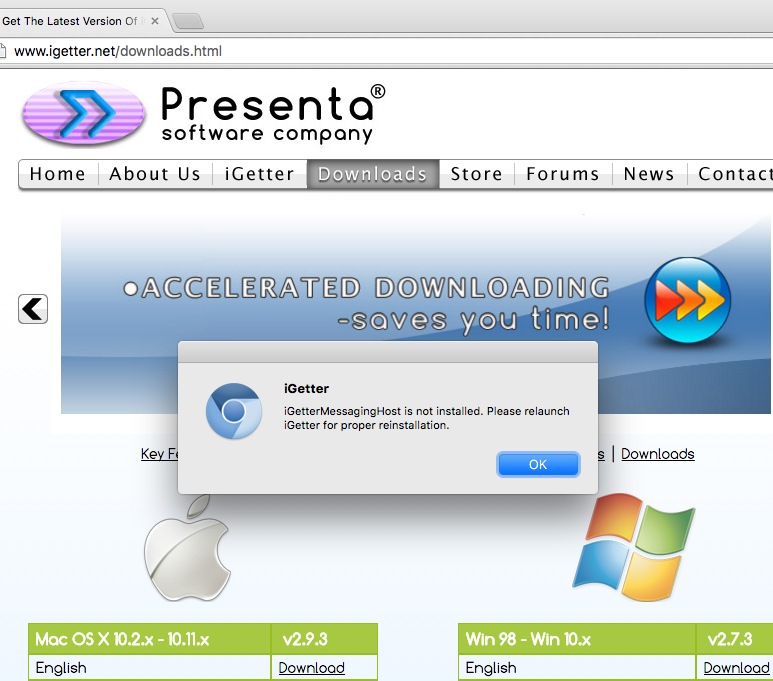 This will disable iGetter Extension until you want to enable it again. Don't delete iGetter extension from the Chrome's Extensions Manager, just disable it. 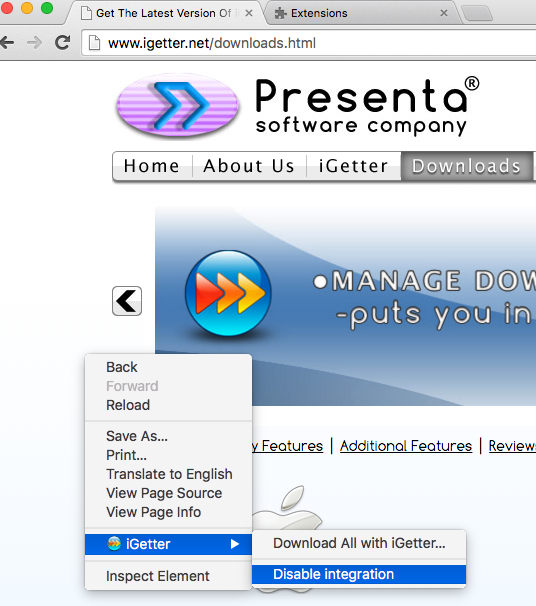 Otherwise, iGetter will not be able to install/uninstall its extension in Chrome any longer. If you delete the extension you have to install it manually using the last link below. 3. (Optional). Start iGetter and turn on "Add Contextual menu support for Internet browsers" and "Integrate with Internet browsers" options in iGetter preferences, Integration panel. 4. (Optional). Enable iGetter Extension that was disabled in point 1. I'm using Opera for Mac 48.0.2685.32. I've carefully followed all steps to resolve the error message "iGetterMessagingHost is not installed. Please relaunch iGetter for proper reinstallation."" I have checked all iGetter parameters you describe, and carefully install the messaging client as also described. Dowsn't work, and it shouldn't be this hard to get a commercial product to work as described. What do you suggest I do now?